The great Orson Welles used to say :”A long-playing full shot is what always separates the men from the boys. Anybody can make movies with a pair of scissors and a two-inch lens.” And as usual, the master was totally right. Thanks to movies such as “Children of men”, “Gravity” or “Birdman” (and a lot more) the sequence shots are once again very popular and with the help of digital cinema that removed several limitations we previously had (such for instance the time limitation of 10 minutes due to the size of 35mm film magazines), this kind of shot has become RELATIVELY easier (or at least possible even for small and medium-sized productions). The capital letters are on purpose, since shooting a one-shot sequence is still an extremely complicated thing to do, the longer the harder. Last week, a friend and DoP offered me the chance to pull focus on a short movie which would be shot on a single shot of approximately 1 minutes length, in a studio with 9 actors. The camera would be the whole time on a J.L. Fisher dolly with rubber wheels to not disturb the actors with tracks and to give the grip more freedom of movement. Truth is that I like challenges and I had never participated in such a project, so I accepted at once, also thinking that it would be an amazing training. And it was! For the sake of the argument and to make this post more digestible, I’m going to divide the topic for the different departments, leaving the camera dept at the end, because is the one I have to speak about the most. LIGHTING: If you think that a single take shot is tough for the focus puller, think about the lighting. While in “normal” situations, the cinematographer can fine tune the lighting for almost every shot, in this case he is forced to design a light that must be “good” for every camera and actor blocking all along the shot, also keeping in mind the set, double shadows etc. A real puzzle with lot of elements, some of which will be changing until a very short time before the beginning of the take. If you want my two cents, it is paramount to have at least one day of pre-lighting or even more, depending on the size of the set, the number of sparks in the crew and so on. We also have to remember that a lot of lights will need to be hung from the ceiling, which makes the setting and fine tuning slower than usual. 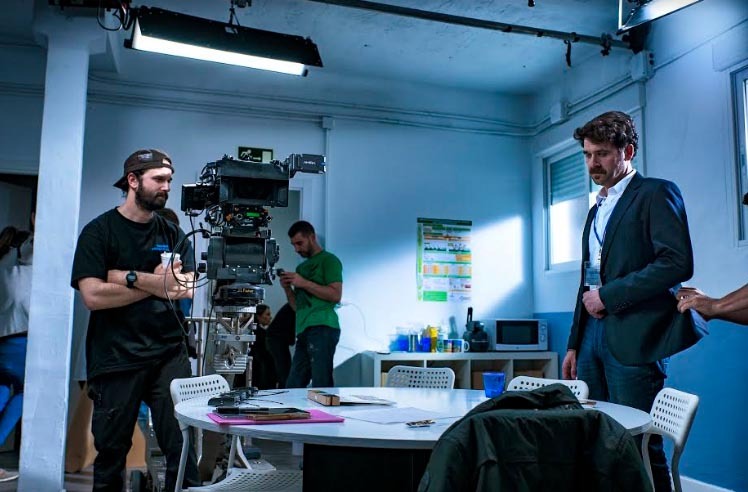 GRIP: In a sequence shot it is extremely likely that the camera will be moving a lot, regardless we use a crane, a steadicam or a dolly, so the Key grip is an incredibly important part of the crew. In our case, in the beginning steadicam was an option, due to the size of the set, but when we timed the action it was between 15 and 18 minutes, so we ended up choosing a dolly Fisher, and I think it was a good call. As I was saying, it is mandatory to have an highly experienced key grip: a long shot is kind of like a concert, where is crucial that every instrument is played precisely and at the right tempo. The difference is that just a few people will notice if the third violin miss a note, while a bad camera movement, a moment of softness in focus or a wrong line from one actor can jeopardize the whole shot (and everybody will notice that). Mi advise is to have a whole day of boocking rehearsal with and without the camera, so the key grip can memorize the action and the movements by heart. CAMERA: Last but not least. From the angle of the camera dept, there are several things we should keep in mind more than usual. a) batteries: it is very likely that the on board battery will have to power not only the camera, but several more devices such as wireless follow focus, on board monitor, wireless video transmissor, cinetape etc. Hence, it is very important to actually test the duration of the batteries we have (that should be done in the rehearsal day) and see how much of a single battery is needed for an entire shot. By doing this we will be aware at all times if we need to change the battery before the shot or if we have enough power to get through it (even if the shot ends up lasting a little more than expected). If the camera we are shooting with allows that, is highly recommended to put a ground battery and an on board one, so we will always have a back up. If the rental house give us the possibility, a Bee Bop battery plate with integrated SAI will be helpful, even though we need to test it deeply to know how much we can rely on it. b) media: since the shot is going to be long or very long, we will have to discuss with the DIT the resolution and codec we are going to shoot with, according to the capabilities of the production, the workflow and so on. c) wireless follow focus: regardless where the camera is going to be, we are almost surely going to use a remote follow focus. Plus, it is very likely that we won’t be able to be all the time on one side of the camera and that we will end up sitting by a monitor in another room or hidden behind a fake wall. Hence it is once again very important to test the performance of the wireless handset so we don’t have any surprise, as well as the performance of the battery and the speed or the delay in the response. In my case, I was lucky enough to have an Arri WCU4 where the lenses had been pre-mapped so I didn’t had any issue. As focus puller, I personally prefer to be on the side of the camera, so in case of need I can judge by eye the distance to the subject or anticipate the moves both of the actors and the camera, but in this case it was absolutely impossible, due to the size of the set, the direction of the lights and the need to leave space to the actors. I think a focus puller must be able to determine in every occasion where he or she should be, not only keeping in mind his or her job but also and primarily the sake of the shot. d) wireless video system: as for the follow focus, it is vital also to test the performance of the wireless video system, how much of a delay it has and such, since a loss of signal could put in danger the whole shot. We had a Teradek 600 that worked perfectly during the whole shooting. SPECIAL REQUIREMENTS FOR THE RENTAL HOUSE: As long as the budget or the confidence of the rental house allows it, there are a couple of items that it can be very helpful to include in our camera list. Aside of the maximum number of batteries and chargers available, it can be very useful to ask for two extra on board monitor with independent powering. 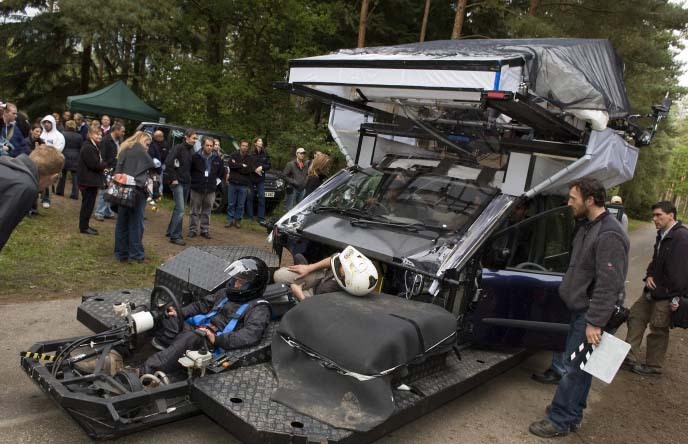 One will be for the key grip, so he can see the shot and help the camera operator in case of need. The other one will be placed strategically on the camera body so the operator can see the shot in a fairly confortable position at all times. Finally, an extra video receiver might become handy at some point. That’s for the technical part, the rest is up to us! Stay tuned! 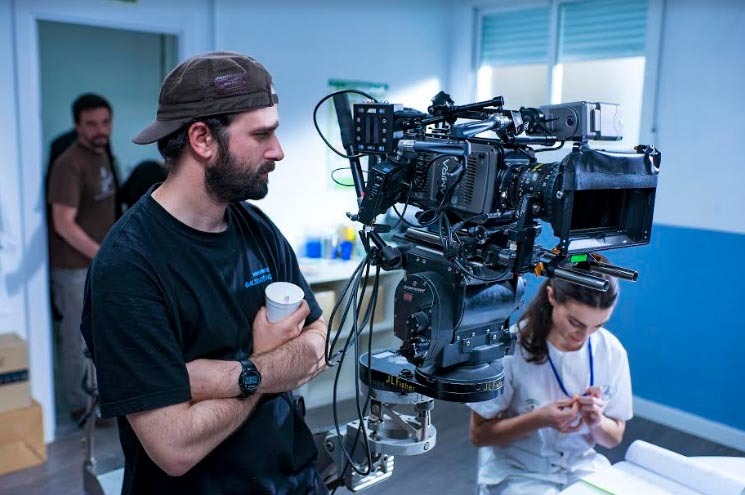 Fabio Giolitti - Focus Puller.